I have to admit I have a bit of a shopping problem. I like to shop. I am not sure when it happened because I have not always liked shopping. I think it is the thrill of finding a great deal that keeps me going back for more. I have been trying really hard to buy less and have been shopping more at thrift shops. That way I still get to shop. I still find great deals and I buy considerably less. You really have to search for the good stuff. But when you find something great like an unopened cartridge for a Leap Pad for next to nothing, it all makes it worthwhile. Target is still my biggest weakness. Did you know that you can get some great deals at Target? At the end of some of the aisles they have clearance items. There is even a forum dedicated to Perimeter Perusing at Target. This forum has some great tips if you are a bargain shopper. The key for me is not buying tons of other things I don't really need while I am at Target. While I was at Target picking up a couple of necessities, I passed by a clearance section in the health and beauty section. I found a pack of 3 Burt's Bees lip balm for $2.98. One tube usually costs at least $2.99. 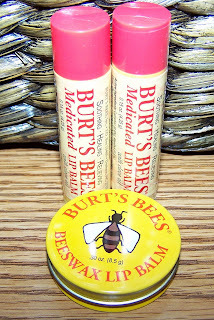 Burt's Bees lip balm is my favorite so I could not resist this great deal. You always need lip balm, right? I also found a summer dress for $4.98, a T-Shirt for $3.24, and a dressier shirt for $2.48. So when I bought some Fair Trade Organic Coffee for $6.99, I did not feel so bad.